Today we are unveiling the newly revised Master Plan (MP). Our previous plan was adopted this past April but at that time it was more of a conceptual plan and not complete. We were still working out the details when our architect and friend John Harbottle III passed away suddenly. One thing was for certain, John's vision of the new "golden age" bunkering style was bold and magnificent which we can see by the looks of the six traps we completed just before he left us. Also, John supported my very unorthodox mowing pattern idea that resulted in what we call "teeways". The teeways have been overwhelmingly accepted and give the course a much more simplified, natural look that fits right in to the classic look of the courses built in the "golden age". John had left us with many ideas that had not been cemented into the plan. He talked about removing this or that bunker, and adding short grass here or there. He was big on lengthening the course trying to look outside the box at possible teeing grounds to keep our course current with the forever farther traveling golf ball. 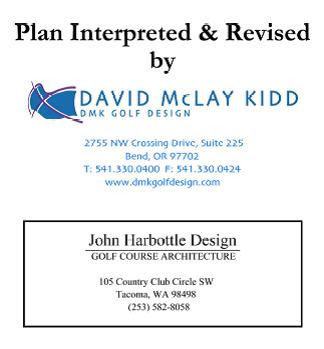 In order to move forward with our much needed bunker remodel and the desire to have a complete plan for direction, we needed to find a new architect to help us finalize the plan. After interviewing a select number of individuals, the Committee determined that Nicholas Schaan was the best candidate. Nick is a Senior Associate for David McLay Kidd (DMK). Nick is also a huge John Harbotttle fan. Nick and John worked on many projects together and they golfed together when of course they would just talk for hours and hours about golf course architecture. The Committee feels without question that Mr. Schaan is the most qualified person to carry out John's vision here at Tacoma C&GC. So with that being said, here is the new heading to the Club's Master Plan. 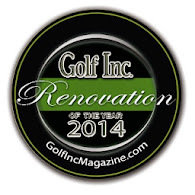 Secondly, a major component of the plan is the expansion of fairway turf. 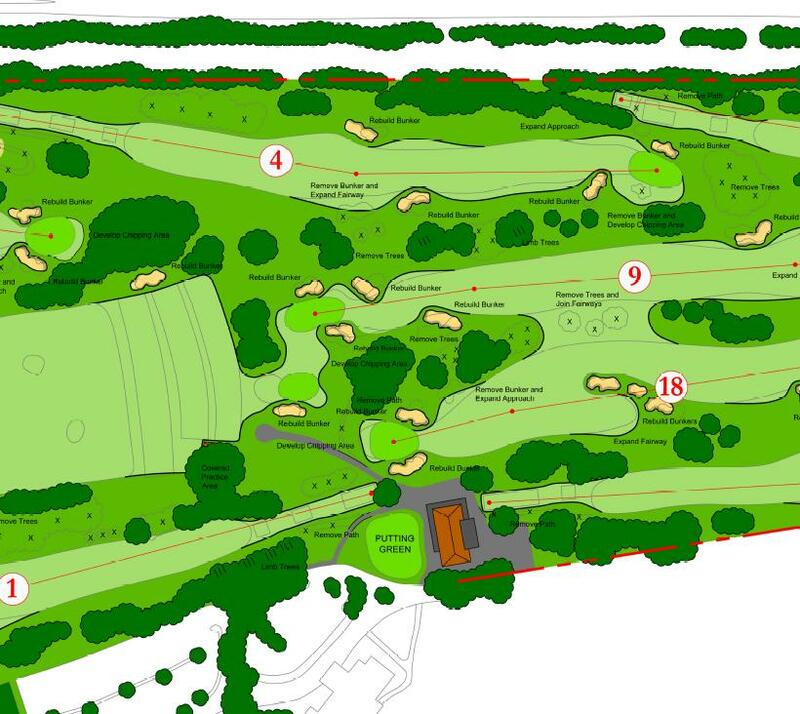 The teeways have been overwhelmingly accepted and now that concept is taken further to include large areas around greens. Several bunkers will be eliminated to facilitate this concept, which is hardly a new idea. In fact this design element is very common on older, classic designs and John implemented it all the time in his designs. Lastly, there is significant lengthening of the golf course. 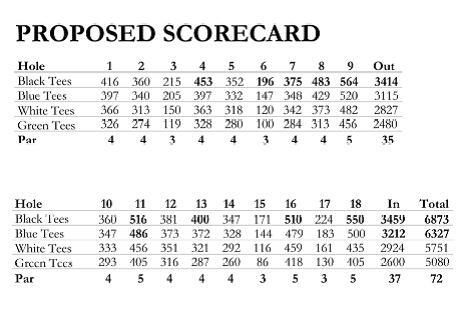 New championship tees are to be constructed on 4, 6, 7, 8, 9, 11, 13, 16, and 18. The new course will almost be 6900 yards from the tips and yes that is still shorter than most championship layouts but long enough that no more will the golfing community describe the course as "short". It's worth pointing out that constructing tees in conjunction with building bunkers results in a "win win" situation. That is we get the much needed length for the course but also a logical use of all the waste soil generated by excavating the old sand from the bunkers. Using spoils from a bunker renovation to build tees is a very common and sensible strategy. Now, let's look at the plan in detail. Starting at the north end of the property, you'll see that greens 1, 2, and 3 all get some short grass added around them. Also, the fairway bunker on #1 gets eliminated. This bunker was only built to get rid of the spoils dozed off by the construction of the tennis courts. 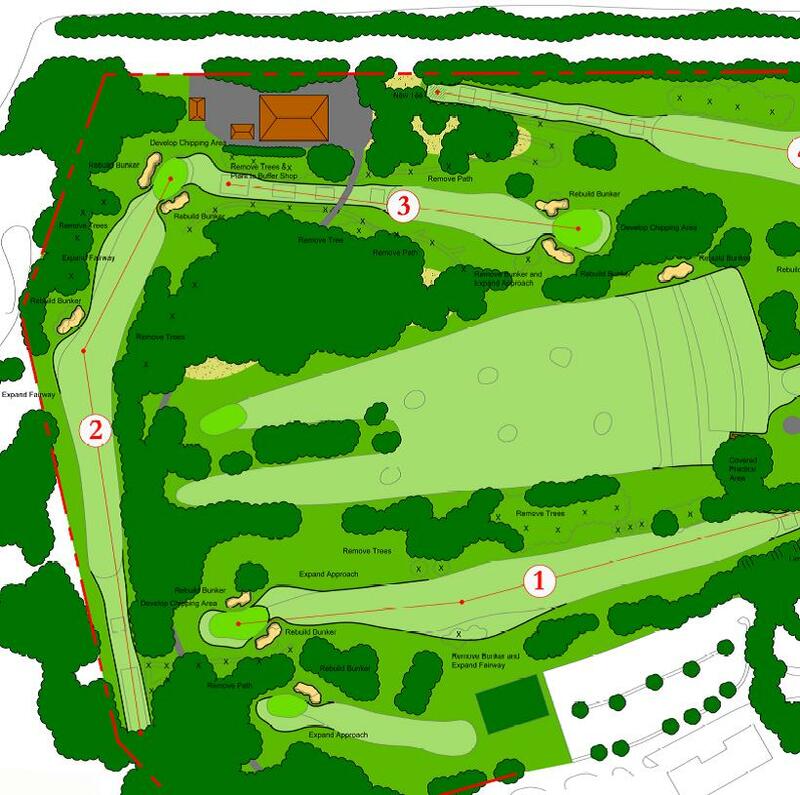 Harbottle was opposed to fairway bunkers on the opening hole so really this is a great idea to get rid of it. The bunker 20 yards short of the par 3 third hole also gets eliminated. This bunker mostly penalizes the high handicapper and really this uphill 215 yard beast is already hard enough without it. Another 30 yards gets added to the 4th hole which arguably makes it the hardest hole on the course. Yes, at 435 yards #4 is already one of our longer holes, but John stressed that we need to keep the long holes long, and the short holes short so as to maintain good variety of shot value. Moving southward on the plan, you see that two bunkers are removed on #4. One large bunker on the right takes the place of two. The greenside bunker on #4 gets removed since you cant see it from the landing area and it is a great spot for a short grass collection area. Fairways 9 and 18 become one in this part of the course creating a really neat, huge open area that will be a place you can bail out from 18 if you feel that you don't want to try and carry the nasty bunker complex ahead of you. This picture also shows that the planting right of the first tee is removed. That idea is seen throughout the plan. All plantings of ornamentals are to be removed from the interior of the course to create the most natural surroundings as possible. The little bunker short of the 18th green gets replaced again by short turf. Pitching into the green off a tight lie over the bunker will be very challenging and more fun than hitting out of a bunker over another bunker. Moving through the plan form North to South, this picture shows a lot of interesting stuff going on in the center of the property. First, 5 and 8 green are connected together with short grass while a couple bunkers are removed. That will be some seriously fun golf. Also, 6 tee and 18 tee are combined into one teeing ground. I just love this idea and I'm sure this will be my favorite spot on the whole property once this project is completed. The bunker left of #10 green gets replaced with fairway turf which will be so challenging as that green slopes away from that area. You can see that all the holes in this picture except 17, will be lengthened. 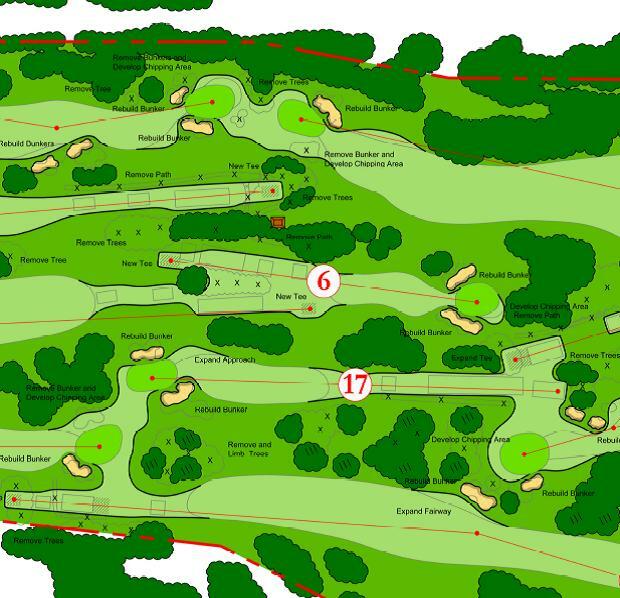 Three of these holes are par 5's and currently all of those are way too easy to reach in two. For this reason, adding length to these par 5's is important, but the most important lengthening is that which will occur on the 11th which is at the bottom of the picture. Right now the golf ball is going so far that even the average hitter is coming close to hitting those putting on the 16th green. I mean really, this is the one of those tees that has remained in the same spot for the entire history of the course. So this is where the Club's founders were hitting the hickory stick and gutta percha ball. This hole has gotten way too short with the improvement in equipment technology so it is imperative that this hole gets lengthened. Another important thing to note in this picture is that all the cart paths get removed. We have been picking away at this over that last couple years with great success. I'm sure no one misses the cart paths we recently removed on 4, 8, and 12. Of course to pull this off, we need to remove trees for added sunlight, and convince people that they can drive over and down the middle of the teeways so that the wear caused by carts is distributed over a large area. 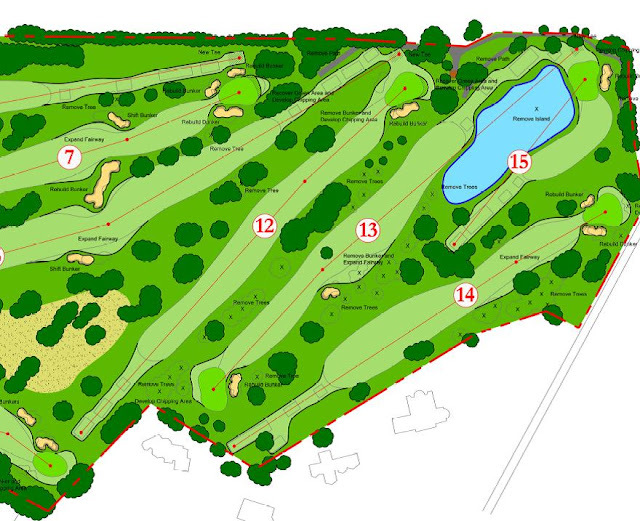 This last picture shows the plan for the southern most area of the course. Again there is lengthening, the most significant being on the 8th hole. This monster par 4 will be touching 490 yards which makes it again one of the hardest holes anywhere. The opportunity to lengthen the 16th has only recently been envisioned as the loss of that large oak left of the tee just occurred during the ice storm this past January. This par 5 has been chewed up recently by long hitters and so this opportunity to add yardage is really a gift from mother nature and a much needed improvement. One bunker is removed from each of the greens on 11, 12 and 14. This yields the opportunity to create "run off" or "run on" areas that make golf so much more fun and are equally as challenging as bunker shots. One thing you might notice is that there will be significant tree removal on holes 13-15. Mostly these are smaller trees that were planted since the construction of these holes back in 1989. This is something that Nick pointed out on his last visit. Forever people have commented that the "new holes" don't look or feel like the holes on the original part of the course. One of the most obvious differences between the two areas is that the "new holes" have many younger, nursery sized trees growing on them. The original part of the course has more clusters of mature trees and a nice scattering of open areas. I couldn't agree more, that by removing the smaller trees and leaving the mature trees, the "new holes" will look and feel much more like the rest of the course. In closing, just in case you were wondering, I love this new plan. Once completed, I feel that it will definitely be the best Tacoma C&GC has ever been. Of course the new bunkers will look amazing. Of course the teeways will be even more amazing than they already are, and the much needed length will ensure that this course continues to challenge the best players in the game. One things for certain, it will be a mission accomplished in that the course will look and play like a course built in the "golden age". The classical architecture from that period will once again adorn the grounds at Tacoma C&GC, and I imagine it will be just as John envisioned it. To download a copy of the plan that you can look at, click HERE. It is a very large file so when you click on it, be patient as it loads. Once loaded and you see the image, click on file and then download.